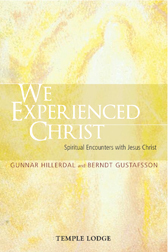 Curious as to what they might discover, two theologians advertised in a national Swedish newspaper for people to write in with their personal experiences of meeting Christ spiritually. They received more than one hundred rich and varied responses, even from some people who described themselves as non-religious. The reports described extraordinary, surprising and usually unrequested experiences. Most of the correspondents had not previously spoken of what had happened to them, often out of fear for what others might think. These precious and valuable experiences are gathered together here and complemented with wise and insightful commentary by the authors, Professor Berndt Gustafsson and Dr Gunnar Hillerdal, both serious academics. The accounts they present form an extraordinary testimony, which will be of interest to any open-minded person seeking truth and meaning in life.